40 years of providing information, expertise and support in understanding and preventing alcohol and drug abuse. Write a card—A simple handwritten thank you card is a lost art, but a beautiful way to give thanks. Write the volunteer exactly how they’ve impacted you, the organization and the community with their good deeds. It’ll mean so much to them. Donate to the cause—Whether it’s donating money or time, the given effort will not go unseen. The volunteers of the organization you choose to donate to will be so appreciative and know that their work is actually inspiring others to do the same. The Center for Alcohol and Drug Resources, a program of Children's Aid and Family Services, is a recognized leader in community and school-based education programs about alcohol and drug abuse prevention. Founded in 1979, The Center provides extensive resources, information, expertise and support in understanding and preventing alcohol and drug abuse and advocates for responsive prevention and treatment services. The Center offers evidence-based programs to communities and schools, as well as a full-service resource and referral center. The Center has programs, services and workshops for people of all ages to strengthen families and promote healthy lifestyles. 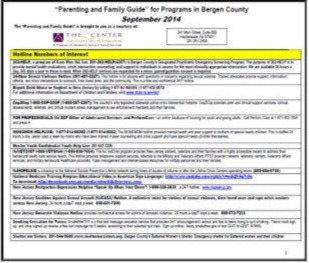 The Center is the official Prevention Resource Center for Bergen County and towns East of the Passaic River in Passaic County. Watch the Bergen County Prevention Coalition PSA entitled The voices of Addiction of Bergen County. The video tells the stories of three people who live in Bergen County, New Jersey; a mom whose 21 year-old daughter passed away after overdosing on heroin, a young man incarcerated in the Bergen County jail who was a high school track star and began using painkillers when he broke his arm in several places, and a young woman who began using heroin when she was 17 and is now in a recovery program. Their stories began similarly - drinking alcohol and smoking marijuana were fun things to do and not a big deal or anything that was of great concern. The link between early use and the use of pills and heroin are what followed with each story’s outcome different from the other; with death, incarceration, and recovery. This grid is updated monthly, September through June. If you are a service provider and wish to promote your programs on this please contact Chanel Dupree at cdupree@cafsnj.org. Click on the grid below to download (pdf format). We want you to know that they are not alone in managing issues related to addiction, there are resources available for help and support. Reach out to The Center for Drug and Alcohol Resources at 201-740-7069 or thecenter@cafsnj.org for more information or to access resources.